Amazingly bright beam (95000lux @ 1m) compared to the size of the unit. High speed pan/tilt movements assure dynamic show programming. A special filter (included) transforms the unit into a traditional “wide beam" moving wash.
PRO-defaults: basic settings (adjustable) for use on professional DMX-controllers. AUTO-defaults: basic settings (adjustable) for easy master/slave use. Optional remote controllers available: wired CA8, wireless RF8-SET or RF-DMX CONVERTER. 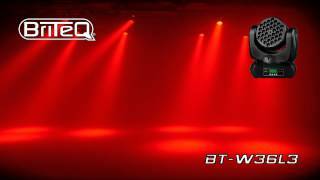 Considering purchasing the Briteq BT-W36 L3 Moving Head Wash - 36 x 3Watt Leds ? Have questions? Ask people who've recently bought one. Do you own the Briteq BT-W36 L3 Moving Head Wash - 36 x 3Watt Leds ? Why not write a review based on your experience with it. 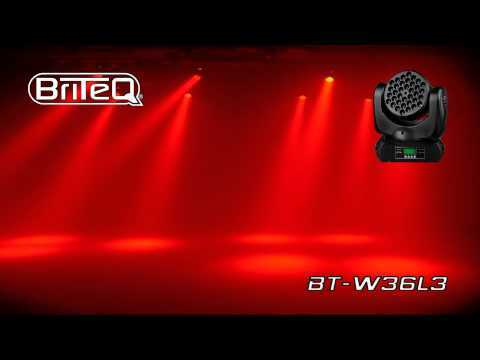 Seen a video for Briteq BT-W36 L3 Moving Head Wash - 36 x 3Watt Leds online or have you own video? Check out Briteq BT-W36 L3 Moving Head Wash - 36 x 3Watt Leds on DJkit.com!